The Generally Accepted Accounting Principles are a number of rules and guidelines that accountants follow in the preparations of financial statements and record a summary of transactions. GVK Group uses these GAAP rules in all its transactions, which allow them to achieve consistency in reporting records of all its transactions. According to a reputable Vancouver accounting firm – there are five major principles that apply to managerial and financial accounting at GVK Group as discussed below. Accounting Entity: The accountant has to keep all the company’s operations of a business entity detached from all personal transactions. In a sole proprietorship, the owner and the entity are considered as one, but in accounting, they considered to be two entirely different entities. Therefore, there is a need to define the entities precisely. Monetary unit Assumption: Accounting deals with the economic activities of measurements and obligations and only those that can be shown in terms of money are recorded. It is assumed that the currency has not altered over time. Hence, accountants disregard the effects of inflation on the recorded amounts. Time Period Assumptions: This principle makes assumptions that it is a possibility to report intricate and in progress activities of a business in a relatively short and distinctive time intervals. For example, five months ended July 31, 2014, or the four weeks ended July 1, 2014. The shorter the period, the more likely an accountant may be needed to give an estimate of that elapsed period. Cost Principle: Many accountants prefer to employ cost estimate because of its objectivity. Accountants view cost as the amount spent initially when an item was purchased, no matter the year the purchasing took place. Thus, financial statements reflect the historical cost amounts, and it is not possible to know the company’s long-term asset value. Due to this principle, assets are not reflected to show any increase in valuation. The only exceptions are stocks and bonds being traded on the stock exchange. Full Disclosure Principle: This principle ensures plentiful pages of “footnotes” attached to financial statements and thus any financial statements prepared are not, usually, explicit as to the financial capability of a company. GAAP rules allow potential investors to have a trustworthy view of the firm’s financial standing. The principles allow firms to report consistent financial statements. Yet, if you decide to register a business in BC, Canada – you will be a subject to Canadian taxation and accounting system. Great guidelines. The full disclosure is extremely important! Great guidelines on small business. Accounting entity, Monetary unit Assumption,Time Period Assumptions, and Cost Principles have been covered well. What can I ask more? Thanks for posting such a great knowledgeable post. Accounting principles and guidelines must adhere to the ethical standards so as to provide proper maintenance of records and data. Generally small business owners do their own accounting services themselves but some prefer to hire knowledgeable accounting professionals. 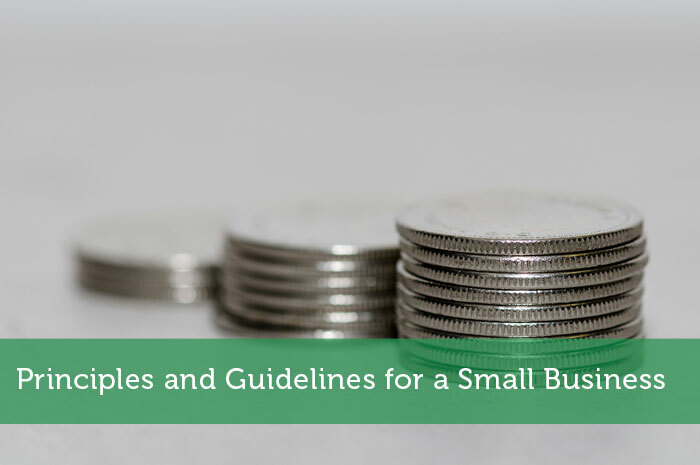 The principles and guidelines for small business owners mainly emphasize on how accountants conduct and format their reports. GAAP abbreviated as “General Accepted Accounting Principles” are certain principles and guidelines that all sizes company and industries cling to. But there are some other points which I think you might have missed and it is revenue recognition principle. Accountants keep your business consistent, reliable and verifiable. Thanks for the guidance over the set of principles on GAAP. Great blog! !